Terrain parks and features are hot. We've compiled some articles on what to look for to make your family terrain adventure a positive one. More coming at you soon! Terrain Park Safety: A must read for families BEFORE they hit the slopes. Innovative Programs: Park lessons & clinics - yes learning can be fun! The Stash: Northstar goes au natural! Mammoth: Go big or go home! Building a park: Art or science? Mount Snow: Terrain for teens; terrain for toddlers! 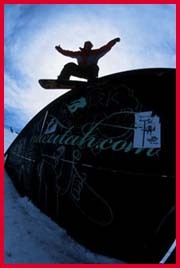 Sugar Bowl's Terrain parks rock! Freeriding Buzz: What up dawg? Summer Camp Directory: learn to go big this summer! Okemo's Big Air Camp: Fun. Fun. Fun. JOIN THE RIPPIN’ RIDERS TEAM!!! . If you rip.. or want to… be a product tester. Join the Rippin’ Riders Team for deals, discounts, and first shot at testing new product.